At Rodney Street Tennis and Tutoring Association (RSTTA), students take the skills they learn on the courts—how to use teamwork, how to use discipline and how to focus—and apply them to the classroom. The physical activity also helps them stay healthy and active, which in turn helps them perform better academically. 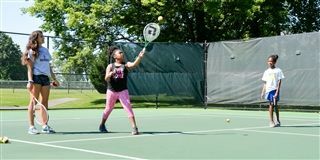 For nearly 40 years, Rodney Street Tennis and Tutoring has been using tennis as a way to get kids engaged, keep them healthy and teach them about life skills, and that philosophy is carried into the classroom with educational enrichment activities. This year, through a partnership with Tower Hill School, Rodney Street Tennis and Tutoring has been able to take that mission even further. Rodney Street Tennis has been doing summer camps since the organization started, but for the past few years the kids spent the mornings at the Rockford Park courts and were then bused to the RSTTA office downtown. This year, students spend the entire day at Tower Hill, where they have more space and are able to break into small groups and work on age-specific programming. “Here having everything very centrally located to each other, like the classrooms, the cafeteria below, and of course the tennis courts are right out back, has made a huge difference,” Olmstead said. It’s also made a big difference for the youngest kids, who in previous years have played on the baseball fields using temporary nets. This year, they’re able to play on the actual courts, which Olmstead said makes them feel like professionals. The partnership has benefitted Tower Hill as well. Over the past few weeks, Tower Hill kids have gotten to know the kids from Rodney Street during Before Care. It’s also a program that just made sense. Through the partnership, Tower Hill students are also given the opportunity to tutor. Jasmine Minhas ‘18, Kirit Minhas ‘20, Malcolm Johnson ‘18 and William Schlerf ‘20 all volunteer as tutors.